This carefully curated sequence is complied by Josh Summers writing for yoga journal. if you are interested in studying with Josh he is coming to New Zealand in 2020. Josh is a licensed acupunturist and yin yoga teacher. This sequence is designed to target both the liver and gallbladder meridians with postures that elongate, compress, and trace the meridian lines up the body with the intention of balancing adverse manifestations of disharmony, stoking the digestive organs, and igniting creativity. Sally has a collection of videos on her site and also a you tube channel. Classes range from yin for anxiety to fatigue. Sally specializes in yin yoga as a tool for connecting with the wisdom of the body on all levels - physical, mental, emotional, and energetic. Shannon Stephens takes you through a yin plus myofacial release targeted at the upper body. Enjoy. We’ve all had days when we’ve been irritable, angry, or just in a bad mood. Maybe we snap at our kids or our partner, and feel remorse—only to snap at them again the very next minute. Or maybe we feel anger and frustration deep inside, but have no way of expressing it, so it continues to boil away in our very core. Yin Snippets. I love this mini series of yin classes on youtube. Aprille has many wee sequences for you to follow. Yoga with Kassandra is a youtube channel devoted to yoga. You may like this one I chose that melts tension and knots especially in the upper body. In Five Element Theory of Chinese Medicine, autumn is the season of the element Metal. Metal qualities are associated with the way energy condenses, moves downward, and slows to stillness. This is a period where we may crave more sleep and gravitate toward warm and nourishing foods, and pay more attention to our inner landscape. As you move through the following Yin sequence, hold the intention of surrender, of letting go, of yielding to gravity, in your awareness. Treat each pose like an experience, allowing each new experience to unfold before you, rather than forcing it to unfold in a particular way. Besides the beautiful photos and the well thought out sequence grab yourself some bolsters and props and check this out. 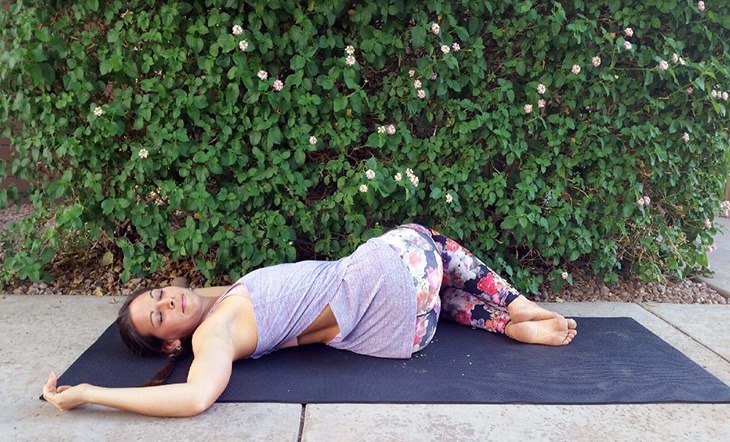 Restorative yoga is a practice we all need more of and definitely can’t get enough of. It’s a guaranteed relaxation technique that will leave the body incredibly relaxed and restored, or what I like to call yoga stoned. Here is a simple sequence to get you started. Although this is tailored for surfers, anyone can use this sequence to restore harmony to body and mind. Chakras are important energy centres in the body, situated along the spine. We have 7 main chakras which are connected to our whole system, our physical, mental and emotional body. This sequence uses Yin yoga poses to gently stimulate the 7 centres, so the energy starts to flow and the chakra can balance itself if needed.